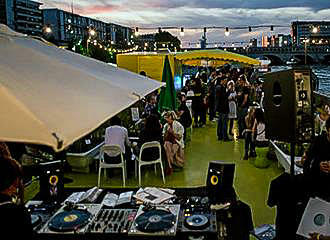 Designed as a floating cultural venue permanently moored on the River Seine, the Petit Bain organises concerts, and a wide variety of different music acts from up and coming artists, along with a terrace restaurant, both of which are accessible to the disabled. 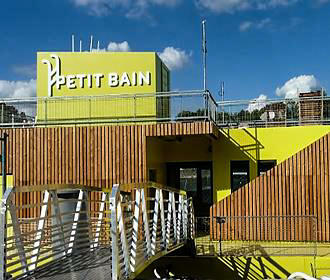 The Petit Bain is a barge that was designed as a cultural venue by the architects Encore Heureaux, which was constructed with three different levels and different spaces, including a 450 seat concert hall that is accessible to the disabled. First launched into the River Seine on 21st December 2000 at 3pm, at that time the boat still needed much work to be done before it was able to open to the general public. And now there is also a recording studio and a terrace on the top deck, which has been decorated with aquatic plants, plus there is a restaurant with a capacity of around 60 people. 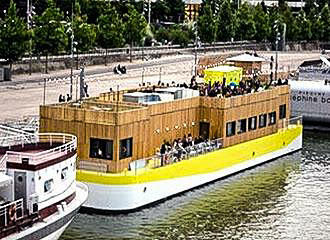 The Petit Bain boat is just over 40 metres long and is a bright greeny colour with wood showing on the outside of some parts, that has been classed as being similar to a tree house, and has become a popular venue for entertainment in Paris. In fact, it plays host to around 250 concerts each year from up and coming artists from a very wide arena of different forms of music. So, from indie to rock and pop to jazz or folk to electro and French chansons through to Latino music, these are just a few different varieties of musical entertainment you could discover. Also, the Petit Bain has a restaurant called La Cantine, which provides dishes with fresh ingredients that constantly changes not just with the seasons, but also how the chef feels on the day, so you never know what is going to be available. Yet it could be things such as tapas, chicken fajitas, chilli con carne, Foie Gras with a house chutney, sweet or savoury selections, etc. You will find the Petit Bain concert hall and cultural venue located in the 13th Arrondissement on quay beneath the Bibliotheque Francois-Mitterrand library right by the Piscine Josephine Baker floating swimming pool. The restaurant and terrace is open on a Tuesday and Wednesday from 6pm through to midnight, then on a Thursday, Friday and Saturday these areas open from 4pm through to 2am. And on a Sunday the times are from 4pm to midnight, however, they are always closed on a Monday. The concert hall is only open where there has been a music event organised, so you would need to check with the Petit Bain to see what the upcoming programme is. Yet you may be pleased to know that this is air conditioned, plus the concert hall and the restaurant are accessible to the disabled, but if you are going to be arriving as a group, then you would need to make a reservation for both the concert hall and the restaurant. Now when it comes to reaching the Petit Bain via public transport in Paris, the nearest Metro station is the Quai de la Gare stop via line 6, or you have the Bibliotheque Francois-Mitterrand stop via line 14, plus this train station also serves the RER trains via line C as well. The bus numbers 62 and 89 will get you close by as well, but we would like to point out that all these forms of public transport stop in the early hours, so you may wish to consider other means of transport back to your accommodation or hotel. And these could be the Velib, which is the self service bike hire scheme, or you could opt for one of the taxis in Paris, for instance.